This is the final topic for the Nutrition Tidbit adult weight management series—long-term weight management. As you recall, the first weight management Tidbit discussed the importance of screening weight to identify those at risk for developing obesity and how to start the conversation about weight as it relates to their health. The next Tidbitfocused primarily on the nutritional treatment of weight management. This final weight management Tidbit will address behavioral change techniques to help sustain long-term weight loss and maintenance in an organized way, and give some of the success indicators for weight maintenance. With greater than 40% of deaths each year associated with negative behavior patterns, of which food choices and eating behaviors are a large component, learning skills to address negative patient behavior patterns are very important for the health care provider. Keeping yourself focused on patient behavior change, which helps keep your patients motivated for the long haul, is perhaps the most difficult aspect of weight management. The primary care provider (PCP) is in a great position to be a behavioral change agent for weight management. The PCP is perceived as an authority figure on health issues, so patients are likely to value whatever information is imparted in a routine visit (whether they like what they hear or NOT! )1 Primary care providers see an estimated 11% of the population every month2 and overweight patients are over represented in that population.3,4 However the present method of dealing with weight problems, which in most cases is inaction, is no longer an option. We know that optimal care for weight management is complex. You, as the care provider, can be instrumental in helping the patient modify behavior patterns that have led to the weight gain and poor health and suggest other behaviors that can lead to or enhance a healthy weight. What are missing in much of the weight management patient education materials are behavioral components. In order to organize a weight management system in your office, include pertinent behavioral themes and have appropriate questions on hand to ask. We have developed a system using the acronym PLEASeR. Below is an explanation of the PLEASeR system using a checklist. Tthe "subject" column contains the themes of the handouts which can be accessed and downloaded by highlighting the subject. The "question-explanation" column contains pertinent questions to ask patients, Click here for a more detailed chart note that can be given to patients and/or used in medical records. Physical Activity Are you able to be active? Paying Attention Do you usually eat only when you know you are physically hungry? Do you usually eat about the same time every day? When you eat do you choose a healthy balance of foods? How often do you eat at fast food places? How often do you eat at buffets? Do you seem to think about food much of the time? Do you eat when not hungry because food tastes good? Do you often eat when you are stressed? expense Do you have trouble eating healthy because it costs too much? Do you need information on weight loss programs, groups, cookbooks, etc.? Setting goals to keep everyone on task is very important. “The last time you were in and we talked about your weight, you said you would walk for 10 minutes three times a week, how did that go?” — not “How is your diet going?” Your patient will then have to give a specific, not general, answer. If the assignment was forgotten, explain why changing that behavior is important. If the assignment was addressed by the patient, go to another behavior that was listed or encourage continued attendance at whatever community program the patient is attending. If the patient has many stresses, give the patient permission to put weight loss on hold until ready. Remember it takes about 1 hour per day to focus on weight-changing behaviors. During stressful times it is important to have the patient focus on weight maintenance. Obesity is a complex, multifactoral chronic disease with both genetic and environmental components. There is no one program that works for all people. However a willing patient, a non-judgmental proactive provider, a plan that incorporates the components each patient needs for success, and the necessary follow-up will go a long way to ensure weight loss and long-term weight maintenance. Manson JE, Skerrett PJ, Greenland P, VanItallie TB. The escalating pandemics of obesity and sedentary lifestyle. Archives of Internal Medicine. 2004;164(3):249-58. Green LA, Fryer GE, Yawn BP Lanier D Dovey SM. The ecology of medical care revisited. New England Journal of Medicine. 2001;344(26):2021-5. Noel M, Hickner J, Ettenhofer T, Gauthier B. The high prevalence of obesity in Michigan primary care practices. Journal of Family Practice.1998;47(1);39-43. Kuppersmith NC, Smoot TM, Williams ED, Cliburn EA. Increasing awareness of obesity as a treatable medical condition. Journal of the Kentucky Medical Assocation. Accepted for publication. Serdula MK, Khan LK, Dietz WH. Weight loss counseling revisited. JAMA 2003;289(14):1747-50. National Institutes of Health. 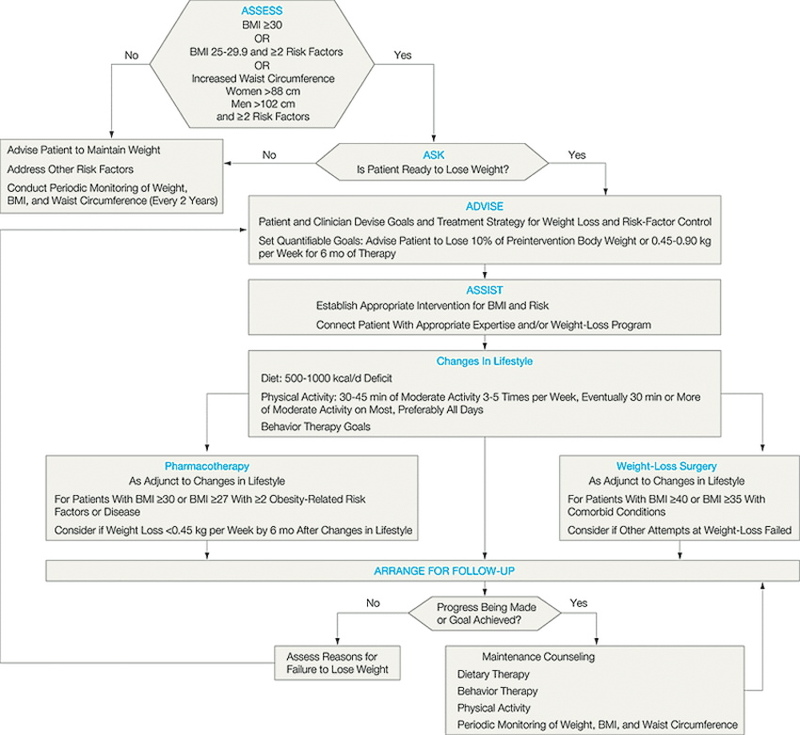 Clinical guidelines on the identification, evaluation, and treatment of overweight and obesity in adults: the evidence report. Obesity Research 1998;6(suppl 2):S51-209. Yanovski SZ, Yanovski JA. Obesity: drug therapy. New England Journal of Medicine. 2002;346:591-602. Klem ML, Wing RR, McGuire MT, Seagle HM, Hill JO. A descriptive study of individuals successful at long-term maintenance of substantial weight loss. American Journal of Clinical Nutrition. 1997;66(2):239-46.